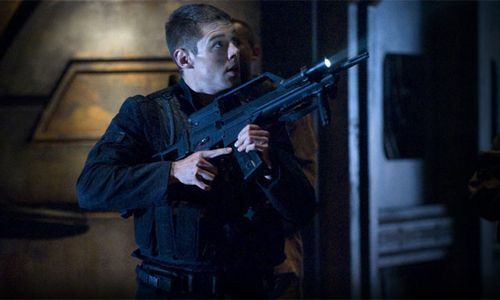 Cultural Wormhole: Stargate Universe - "Resurgence"
Lt. Matthew Scott (Brian J. Smith) hunts for an escaped Chloe. Several of this season's plot threads come to a head in this mid-season finale. 1. Chloe's alien influenced metamorphosis. 2. Destiny's increased encounters with new alien races and ships. 3. Col. Telford's abandonment aboard the seed ship. 4. Destiny preparing Col. Young for a battle just like the ones that occurred in this episode. 5. Eli dealing (or not) with Ginn's death. 6. The crew's increased control over Destiny's systems. 7. Varro's continued feeling of uselessness and attempts to bond with T.J. It sounds like a lot, but most of these points tie neatly into one another. While Chloe is not the most trustworthy person at this point due to the changes happening to her body, she was right about not trusting the Ursini. Not that the Ursini could be completely blamed. There was a discussion about double-crossing them between Young, Rush, and Wray. Speaking of which, I really like the dynamic of these three leaders conferring when there's a big decision to be made that impacts the entire crew. Young comes from the military angle, Wray from the civilian, and Rush from the scientific. Young realized this season that he can't do this all by his lonesome and has gotten better about listening to those around him. Something is going to have to be done about Chloe. The sad thing is that she's as much a victim of her actions as the rest of the crew potentially is. She's fought the influence the best she can, but this episode exposed what everyone feared. Not only has she had her intellect greatly improved, but the physical changes have given her some increased strength. How this is all going to play out is anybody's call. I doubt the writers would kill her off, since Chloe is one of the lead characters, but that would be a shocking development. The battles with the swarming ships are similar to the simulations that Destiny had Young running in his sleep. We're seeing various parts play out, too. Destiny is outnumbered, systems are failing, and Chloe is loose and a threat. The only thing that hasn't happened (yet) is a boarding party. Luckily, these ships appear to be drone ships without any passengers and it hasn't been revealed if they belong to the aliens that were in the simulations. Like Varro, I am growing impatient with his isolation and incarceration. He's being treated like a dangling plot line that the writers have no idea how to resolve. Also, how many of the Lucian Alliance captives are still on board? Two of the three that got any real screen time are now dead. Hopefully, Varro will earn some trust playing nurse. I foresee him coming to the rescue during the fight when the show returns in a few months. While I love the science team, I think it would make sense to start training some of the military personnel to run the defense systems. Figuring out how Destiny works is one thing, but taking her into an actual battle is another. I can't help but feel that she would perform better at the hands of people that were trained for war. The first half of season two has been fairly solid and has felt like an improvement over the first season. 'Stargate Universe' works best when it keeps the plot lines clicking away and is less successful during the standalone episodes. It's no surprise that my least favorite episode of season two so far dealt with the communication stones and a trip back to Earth. I'm really enjoying the increased screen time for Brody, Park, and Volker. It feels like the entire principle cast has been given more attention and character development as a whole compared to last season.